As a past NHRA world champion and multi-race winner, Luke Bogacki is certainly no stranger to an exclusive group of drag racers. However, it was one year ago this week when he added to his bucket list and joined another really select group, that being a K&N Spring Fling Million Dollar Race winner. First it was Jeff Verdi in 2016, Luke in 2017, and this week, another person will join that group when the best bracket racers in the world convene on The Strip At Las Vegas Motor Speedway for the third edition of that famous event. 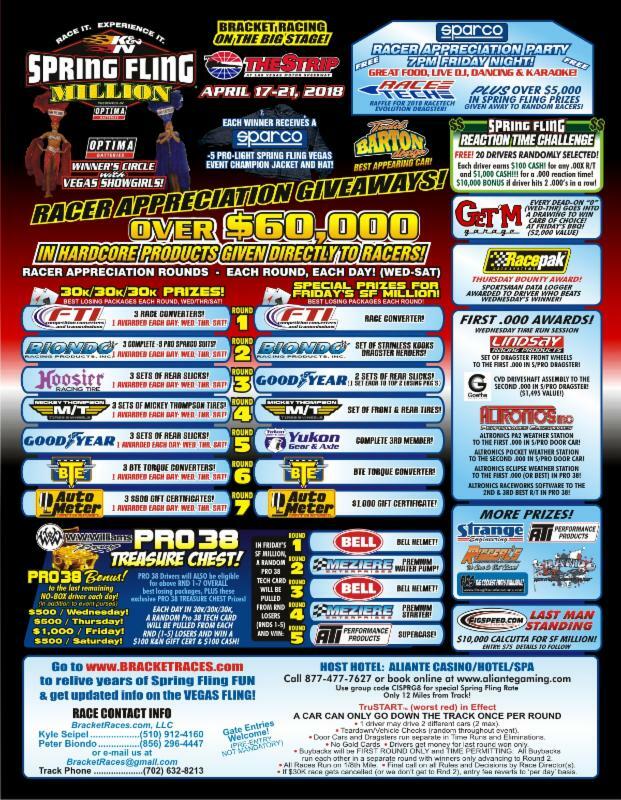 It was eight years ago when co-promoters Peter Biondo and Kyle Seipel instituted their Spring Fling brand of races in Bristol, TN. After five years of success at their east coast event, the pair decided to expand their horizon and add the K&N Spring Fling Vegas presented by Optima Batteries event to another overwhelming success. Attendance at the Vegas race sored to new heights and two years ago, Biondo and Seipel announced expanding to include a payday that has the potential to be the largest prize ever paid out to any drag racer, regardless of class. And thus, the K&N Spring Fling Million was born. As such, racers from all parts of the country along with Canada and Mexico have flocked north, south, east and west to the City of Lights in search of that one exclusive light bulb shining in their lane after a winning run. Beginning on Tuesday, April 17, racers will line up for a free Test & Tune session sponsored by Yukon Gear & Axle. In addition, a limited field of racers will face off with the winner walking away with a brand new American Race Cars dragster complete with a custom Brando paint job. Wednesday opens with the first of three races paying $30,000 to the winner each day (Wednesday, Thursday and Saturday). 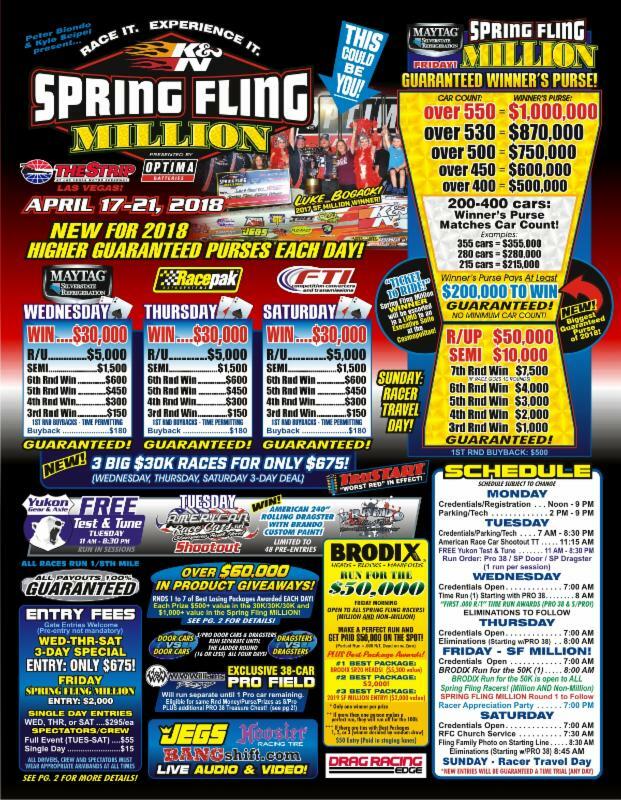 The main event kicks off on Friday with the winner’s share guaranteed to pay $200,000 to the winner, with the number increasing based on car count. If Fridays car count hits 400 cars, the winner will walk away with a staggering $500,000. The actual million-dollar prize kicks in with a car count of 550 cars. Round money of $1,000 begins with a 3rd round win and only grows from there. And has been the custom, in addition to the Million Dollar trophy and check, the winner and his family will be whisked away in a custom limo for a two-night stay in the Executive Suite at the Cosmopolitan Resort. In addition to the purse money, each Spring Fling event is highlighted by over $60,000 in product giveaways. On Friday morning all Spring Fling entrants will be given a single time trial in the Brodix Run For The $50,000 with the best package walking away with a set of Brodix SR20 heads. On top of this, if a driver puts down a perfect run; a combination of a .000 reaction time along with a dead-on the dial elapsed time; that driver will get paid $50,000 on the spot. The fun all begins on Tuesday with all of the action streamed live on BangShift.com thanks to JEGS and Hoosier Tire. For more info, visit www.bracketraces.com and on Facebook.